Kelaokalani Fifita Sitake is an American football coach, currently head coach at Brigham Young University. He played college football under legendary BYU coach LaVell Edwards. 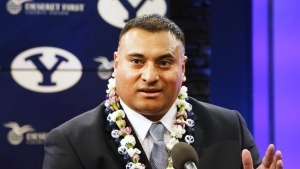 Sitake was born on October 10, 1975, in Nuku’alofa, Tonga. His family left Tonga and settled in Laie, Hawaii, when Sitake was a child. He later graduated from high school in Kirkwood, Missouri. After he earned a bachelor’s degree in English from BYU in 2000 and signed a free agent contract with the Cincinnati Bengals in 2001, but retired due to an injury. He became coach of defensive backs and special teams at Eastern Arizona University in 2001. He became graduate assistant-defense coach at BYU in 2002, then moved to Southern Utah University where he was first running backs and tight ends coach and then offensive line and tight ends coach. From 2005 to 2014 he coached at the University of Utah, serving as linebackers coach, defensive coordinator and linebackers coach, and then was assistant head coach, defensive coordinator, and linebackers coach. During his time at Utah, he helped the Utes win seven of eight bowl games. He had served as assistant head coach and defensive coordinator at Oregon State for one season before being appointed head coach at BYU in December 2015. He is the first Tongan to become a collegiate football head coach. Sitake is a member of The Church of Jesus Christ of Latter-day Saints. He served as a full-time missionary in Oakland, California. He and his wife, Timberly, are the parents of three children. This page was last edited on 29 April 2016, at 22:00.